Down two against the Grizzlies with just 2.7 seconds remaining, you’d probably expect the Spurs to try and get the ball into Kawhi Leonard’s hands. That’s what the Grizzlies thought too, so when LaMarcus Aldridge screened Leonard’s man, Wayne Selden, his defender, Brandan Wright, went with Leonard too. 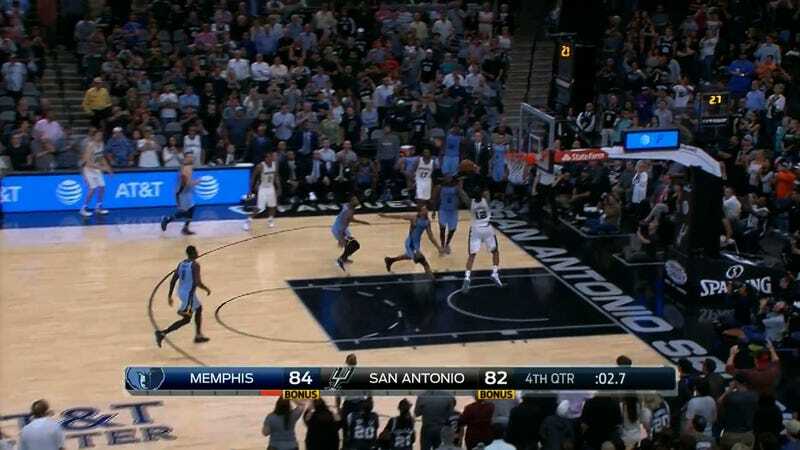 That was a mistake, and freed Aldridge up for the game tying alley-oop. What really makes this play work, though, is having Pau Gasol inbound the ball. Not only is he a fantastic passer—this is basically a soccer throw-in—but it also pulls Marc Gasol out of the paint, giving Aldridge an unimpeded run to the hoop and lay-in. The Spurs went on to win 95-89 in overtime.